Good grief! What in the world happened to the charming English actor Rupert Everett, star of such movies as, My Best Friend's Wedding and The Next Best Thing. Well clearly he's had a significant amount of plastic surgery done to his face. It appears to be a full blown facelift, mainly focusing on the brow, eyes, and cheeks, perhaps topped off with a little botox in the forehead area. 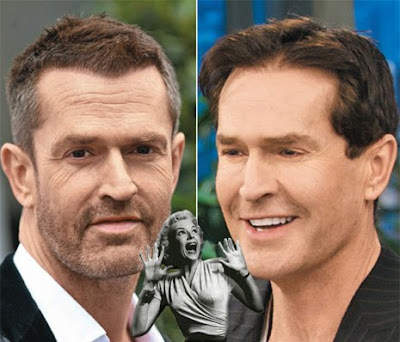 From the looks of this before and after picture, do you think Rupert Everett went too far in his efforts to restore a youthful appearance? Are you sure that is even him? If so, that is really scary! OH WOW!! That doesn't even look like him anymore. I read some interview recently where he claimed that he has lost acting roles because he 'came out.' Um, that's not the problem Rupe.